Well Martijn I'd be pleased to oblige your request if only you could provide examples of your drawings with the red circled areas that also include the lower portion of the fingerprint. The lower portion is essential to show the obvious same ridges. The ridges I had colored in green in my examples a few posts back show a fork that touches a horizontal ridge in a way that is clearly discernable in all three prints. There are several short ridges and forking ridges both above and below the pattern we are challenging each other about. These points, once matched allow ridge counting to the pattern area. 1) Draw your argument on the full prints. 2) 1000 times the original tells me the markings are automatically altered. Use a size that is clear and not stretched. Try to use "save" rather than "save as" to help keep the quality in editing. Question - in the 1933 what compelled you to ignore the thick ridge bridging the space between your green incoming line over to the gold line? Did it not suit your plan for a loop? Looks more like that green line should continue right on over to the gold and down to the other green. How could you miss that? Patti, I we have no disagreement about the golden line: it is connected to the green line (you can ignore the micro-spaces in the connections). Why did you assume that I wanted to make it look like as if it is not connected? Okay, I will honour your request again: I will make new pictures with the splitting green lines that you drew correctly in your pictures. PS. Regarding your comment about the 1000X ZOOM I think I don't have that problem on my monitor (beyond that I think it is just another irrelevant thought from your side... just like your considerations regarding the resolution of the pictures). 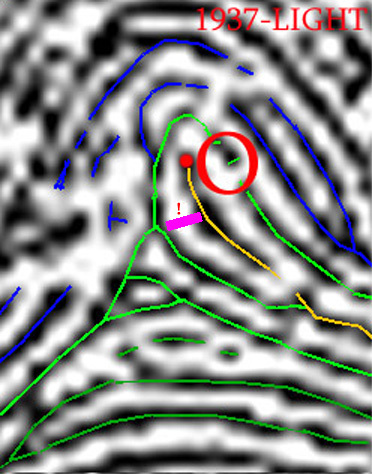 Patti wrote: Well Martijn I'd be pleased to oblige your request if only you could provide examples of your drawings with the red circled areas that also include the lower portion of the fingerprint. If your objective is really to find a significant agreement... then I now ask you to confirm that you can agree about ALL ELEMENTS that I have illustrated with colour in my new following picture (see below) - which of course now includes the (darkgreen) 'fork' that you presented in some of your earlier pictures, as you requested!! NOTICE: The colours themselves are not really important. 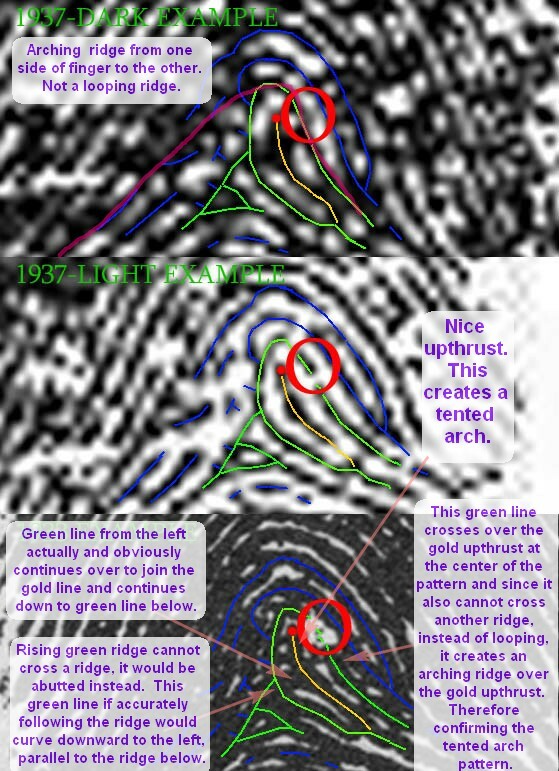 - The dark 1937 print clearly shows the presence of a 'looping ridge line' that connects between the two parts of the light green line. - The light 1937 print cleartly also clearly confirms that at least more than half of the circle surface is closed by a ridge line. - And even the 1933 shows clear evidence of the ridge line, though that evidence is limited to only two black spots: one small spot + a larger spot... but it is important to notice that the position of both spots corresponds PERFECTLY with the 'curve' that we can see in the dark 1937 print. Now, I hope you now see that the 'white large zone' in the 1933 print... is for sure a flaw, because the light 1937 print indicates that in that ridge line there is probably only a very small 'hole'... but we can safely ignore such a small 'hole' because the 1937 print also shows that there is really no other ridge line that is trying to take over that ridge line: simply because the 'golden core line' + the 'blue line' go perfectly parallel at a considerable distance from OUTSIDE the RED CIRCLE. A likewise small 'hole' is seen between the two 'golden lines' - though we can see there that all 3 prints show how the 'green line' gets connected with the 'golden line'. 1 - First of all: we should start here being aware that any fingerprint will always shows some minor imperfections, but often these can be ignored. All three fingerprints have a few of those minor imperfections: in the light 1937 print these manifest especially in the absence of some ridge lines at the left side of the green lines, where various white zones occur; while in the dark 1937 print and the 1933 these imperfection become manifest as 'black spots' between the ridge lines, resulting in that there appear some 'strange' connections between those ridges lines... but those 'black dots' are only the result of the use of too muck ink, so in many cases these do not really represent connections between the ridge lines. 2 - Second: though I realize that the light 1937 print also presents some imperfections (especially seen on the left side of the llight green lines), it has no major flaws at all. And in this sample of three fingerprints the light 1937 print presents BY FAR THE BEST QUALITY because... it is the only print where we hardly see any 'black dots' occur between the ridges lines: and resulting in that in almost the complete fingerprint the path of all ridge lines is quite easily to follow!! 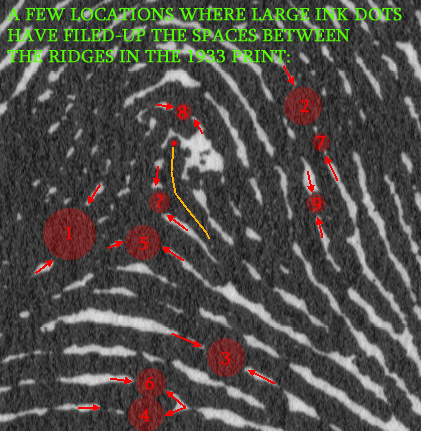 3 - Third, all problems related to the assessment of the fingerprint type can be attributed to the fact that in both the dark 1937 print and the 1933 print we can notice a lot of 'black dots' occur between the ridge lines: in both prints these are seen in nearly all zones between all ridge lines!! The most confusing 'large black dot' is seen just below the 'core ridge line': I have illustrated that dot in both picture with a '?'-sign. But the light 1937 print clearly shows that in that zone both the 'golden core ridge line' and the 'green ridge line' are very well shaped, featured with a perfectly normal curve, and there is not a single indication that there is any ridge line involved that could connect both lines in a very UNNATURAL WAY because such a line would then manifest at an angle of 90 degrees... and such lines are NEVER SEEN IN FINGERPRINTS!!! So, the 1937 presents clear evidence that we should IGNORE the 'large black dot' in both the 1933 print and the dark 1937 print. Just like for example the other dots that are only seen in the 1933 print between the 'golden core line' and the 'green line'. PS. Finally, there is a fundamental reason why the ridges in the RED CIRCLES should not be recognized as 'small insignificant interruptions' in stead of 'ridge endings'. The example (see the red dots) shows how a 'true' ridge line ending manifests: the surounding ridge lines should show also a change in direction as well! Usually when a ridge line ends, the surrounding ridge lines will be redirected towards the path of the ending ridge line. 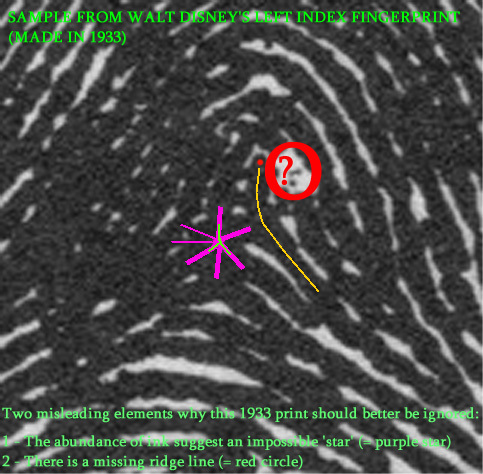 But in all three examples of Disney's fingerprint the surrounding lines - the 'golden core lines' + the 'blue lines' - continue their path and do not converge towards the 'green lines'. ... I guess it is probably a requirement to understand these things before one can understand that all variations in the RED CIRCLES are actually... irrelevant (!) 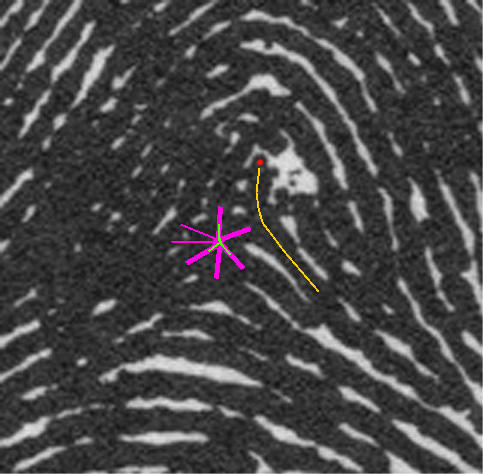 for recognizing that this fingerprint is an example of a RADIAL LOOP. Nope... a microscope is only suitable for studying far smaller objects than a fingeprints. Assessing fingerprints does not only require sharp eye-sight, it also requires understanding of how fingerprints typically manifest. So studying fingerprints, and reading books about how to assess fingerprints (The Science of Fingerprints (presented by the F.B.I.) is all you need!)... should bring your further than buying a microscope. Though using a large loop should be helpful as well! And if necessary... don't be shy to ask more questions!! Thanks, but what is a large loop. Thanks Jeanette, this concerns a fundamental question (because we haven't discussed that topic in this discussion). Can you please post this question in a new topic - preferably in 'forum IIIf - Dermatoglyphics + fingerprints'. I must admit I am certainly impressed with your attempts to help me *see* a loop where there not only is none, but following fingerprinting rules, one cannot be even traced. I appreciate you offering me some lessons in identifying dermatoglyphics - but I think you know quite well after we've been communicating off and on, on forums since around 2000, you know that I am well informed. Even an active member of the American Dermatoglyphics Association. But, I admit I was surprised earlier when you posted your confusion on another thread as to whether we trace on the ridges or between the ridges to discern the pattern. No need to waste anymore of our time unless you can come up with a print that hasn't been used here. I'm surprised some of our other members haven't jumped in - but I imagine it's because of the obvious stand alone nature of the images themselves - without any guidelines from either you or me. Yet, it would have been nice if Richard or one of his students would have spoken about Richard identifying this fingerprint also as a tented arch. I would think that if it could be shown to be a radial loop - that would change the Life Purpose Reading! It's a bit disappointing that in response to my latest efforts to answer your request & idea of finding an agreement about certain ridges, you now suddenly started talking about "to waiste anymore of our time" - even after I have asked you a question for specification in return, and even offered you the invitation to see if we can find any agree regarding the 'large white zone' in the 1933 print + the corresponding zones in the 1937 prints. Yes, it would be nice to see one or a few others jumping into this discussion ... but because I have already shared my observations & conclusions, my interest will be focuss on the arguments behind their assessment. the misleading ' ... large white spot'. Sorry, but I am weary of tracing these ridges over and over. No matter how you draw the lines and point out white spaces (and there are so many on the 1937 prints) you are missing the point. Ridges do NOT make right angles. They abutt. The upthrusts are simply that and nothing more. No recurve. The upthrust is all that is needed here to call it a tented arch. It's also possible to match up the upthrusts in one of the 1937 prints. Unless you can produce a new print or perhaps obtain new copies of the 1937 prints you really are wasting your time trying to show me a radial loop here, maybe someone else is convinced...?... but I'm holding onto how I actually see it. This conversation feels like someone has been trying to convince me that square is actually round and if they just illustrate it and explain it extensively it will become obvious that square is round. But, it just isn't working. It's not like it's an opinion or viewpoint - it's an observation. 3 - The resolution of all three pictures is quite good... otherwise I would not have been able to produce 1000% ZOOMED pictures for the 1937 prints! So, regarding our study the resolution of the pictures is actually... irrelevant!! Again, simply because there is too much ink on the paper in that 1933 print... clearly indicated by the fact that in my last picture I can easily see that the 1933 print is even darker than the DARK 1937 print! "The most common solution is a technique called pixel interpolation that smoothly blends or interpolates the color of one pixel into the color of the next adjacent pixel at high levels of zoom. This creates a more organic, but also much blurrier image." These links explain pixels and pixelated interpolation. The original that you are working with is of very low quality and low dpi. You are enlarging a low quality image. As I explained earlier, when you enlarge a poor quality image, the process is done by the software coloring in squares or dots around the graphic. Therefore zooming the image absolutely results in an inaccurate and blurred edge. 1000% zooming of a low quality print is pretty self-explanatory. "Most graphics software uses a process called pixel interpolation to create new pixels by averaging the colors of nearby pixels to create additional pixels. For some graphics, pixel interpolation results in an image that appears very similar to the original. However, images that contain strong curved or diagonal lines may develop an undesirable pixelated, or bitmap, appearance." Resolution and zooming is very relevant to this conversation. But I already described why there is no upthrust, despite that I am very aware of appearant similarities regarding the 'upthrust-illusion' in the 1933 print and the dark 1937 print. And your reference to 'ridges do not make right angles' (90 degrees angles) was actually MY ARGUMENT why there can not be an upthrust!! Patti, if this purple line really had been there in the 1933 print and the dark version of the 1933... it had been positioned between TWO RIDGES LINES at a 'right angle': but that would be very unnatural - for the reason that your described: ridges do not make right angles!! Actually there is NO WAY you can deny that the 'golden line' and the 'green line' exactly follow the path that I made them look like like... because that path is also seen in the 1933 print and the dark 1937. ... How can YOU ignore my observation!??? Finally... yes, as soon as you would also accept that observation... we could together wonder: why are we confronted with this ILLUSION of an 'upthrust' in the 1933 print and the dark 1937..??? But the answer is quite simple... because I already described that both prints clearly show many other signs that there was too much ink involved: which induced the visual illusions... such as: 'your upthrust'. Patti, you have sometimes been talking about a CLEAR 'upthrust'.... but that is just another example of USING STRONG WORDS.... because such a claim would only have been 'fair' if we we able to follow all the zones right beside the ridges lines. But as you can see in this 300X ZOOM picture of the 1933 prints: regarding 'your upthrust': we can not follow the white lines in that zone at all. We again confronts us with the poor quality of the ridge lines seen in the this picture....! There is OBVIOUSLY way too much ink involved in the 1933 print, because we can hardly follow the ridges lines in the crucial zones. It even almost appears that there is some kind of '7 pointed ridge line star' (see the picture below)... but we both know that if would be rather foolish to even consider that as an option. "Yes, a picture is sometimes worth a 1000 words... but a picture can also induce visual illusions." - 1 You did not recognize that the large white spot in the 1933 print is a flaw. - 2 You did not recognize that the 'your upthrust' is only an illusion that resulted from too much ink in the fingerprint... which results in certain optical illusions like the '7 pointed star'. Patti... it is a bit funny to see that you associate the blurry-problems with 'pixel problems' - while I asked you over and over again to focuss on the CLEAR signs that in the 1933 pictures there is obviously way too much ink involved to follow the ridge lines in that zone. By the way, I can understand that assume that 'your pixel problem' is irrelevant in that 1933 picture. But obviously ... the white zones in the light 1937 print are relatively large compared to the ridge with, so I am confident that in the 1937 print we are not confronted with any signifiant 'pixel problem' related issue at all. You are probably still focussed on 'your upthrust' ... but I am wondering how can you continue doing that now that I have described the 'seven pointed star'??? It is obvious for me that both 'your upthrust' and the 'ridge line star' are visual illusions, directly resulting from too much ink. Because both do not reflect the true path of the ridge lines in that zone. But obviously, this problem doesn't relate to a 'pixel problem'...!! By the way, the same illusion-problem occurs in the dark 1937 print, but there it manifests more like a 'four pointed star'. Yes, I recognize that 'pixel problems' could play a role in that picture... but so far I would even describe that problem as irrelevant in the perspective of the obvious INK problem. Especially, since so far you haven't described any clear clue that a pixel problem really could be a major source of confusion in our discussion...!! Your general references to those wikipedia articles, etc ... are completely 'out of the context of our discussion'. Yes, I recognize your position in this discussion. And I guess this thought reflects your ''black-white' perception about the things that we are discussing here. Quite unrealistic from my point of view... but nevertheless it is an amusing thought. PS. Again, I never tried to 'trick' you anyhow. Seriously... why would I even start bothering about that, while I am observing that you refuse to really consider the consequences of the FACT that there is clearly too much ink involved in 2 of the 3 prints... ? Anyway, thanks for your additional comments + your efforts. Wow! Your own arches are showing!! Let's just agree to disagree. Like I said earlier, I'm ok with your choice to see what you want to see in the ink blotches. Whatever you want to say about the 1933 print to disqualify it - it is only your words. The image speaks for itself to trained eyes. A true researcher would never disregard facts. I would really appreciate if you share your thoughts about the following picuture, because I expect that this picture should make you able to understand why I could never agree regarding your claims regarding the quality of the 1933 print. NOTICE: For the first element is no consideration of the two 1937 prints required!! We can see in the picture below how various SMALL- & LARGE INK DOTS are involved in the impression of the '7 pointed star'. And we can also see that elsewhere in this print even larger inkdots have filled-up many more zones between the ridge lines (and if you only would start searching for likewise 'filled-up' zones... there are MANY MORE!!). Patti, the implication of this picture is that the ink spot that you identified to be part of 'your upthrust' ... is just another example of one of the many large inspots that do not represent a real 'ridge line' in the fingerprint of Walt Disney's left index finger. 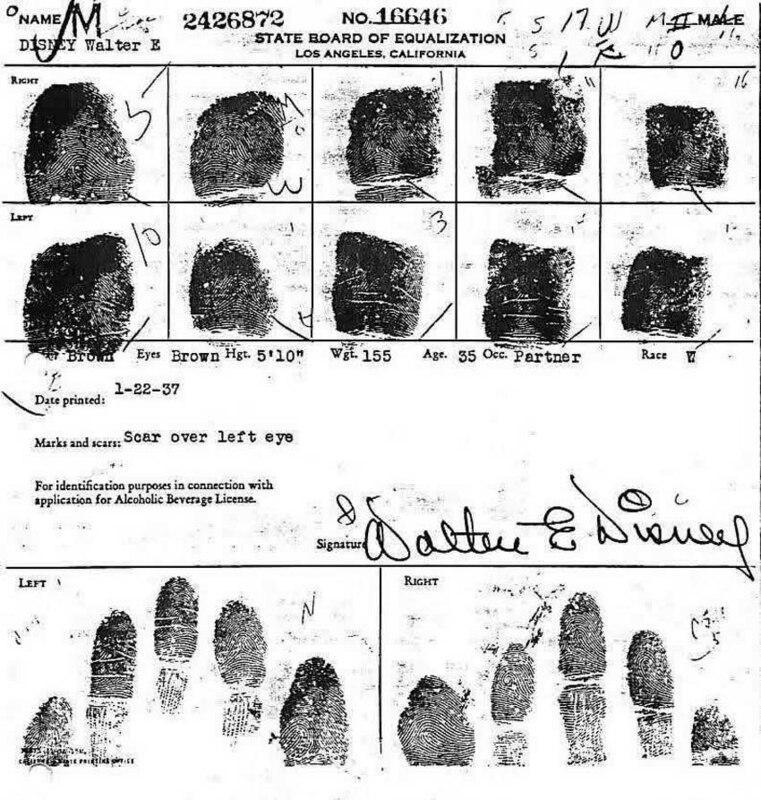 This observation provides even more evidence that - beyond the 2 major points that I described in the former picture - that large parts of this 1933 fingerprints show clear confirmations that the quality is actually quite poor. Again, I already confirmed that your were right on the resolution of this picture: which is excellent indeed... your were absolutely right about that. However, you concluded from that observation that this fingerprint presents the best quality... and that was probably the biggest mistake that you made in this discussion. Ok! I appreciate your offer to just consider the 1933 print. In my really high resolution image on my computer, you can actually follow the ridges in the tiny area (your 7 pointed star) in the impression in the ink. Do you by any chance know anyone that has the book "Lion Paws"? Maybe you could take a look at the quality image yourself without any possible degrading from enlarging. One important note. If you take a holistic look at the print without nitpicking on a loop or an arch, there is a developmental pattern apparent. The center began to develop separately from the edges. The edge ridges flow toward the center. They tend to overlap. The overlapping has a style of it's own and can be seen repeating itself in rows above and below. The tendency for these ridges flowing in from the side as they reach the center is to thrust or rise upward. The area you see a 7 point star (caused by too much ink flowing in the grooves between the ridges - clearly noticible in the better images) and the area I see a short upthrust are very similar in nature and development. I can count 4 attempts at the ridges trying to rise upward. This is all happening in the center of the fingerprint. Above these 4 attempts the ridges continue to cross in true arch fashion. In the center of the print, under the discussed pattern. There are two short horizontal arching ridges. (a longer ridge is between them) This nature to form short arching ridges at the center of the pattern is a repeat in the same area where I see a short upthrust. In the area of your 7 star, it can be seen that one of these short arching ridges, a short ridge line, is abutting crowding ridges coming in from the left. I will try to upload an even better image of the 7 Star Region and link to it sometime today. Meanwhile with a good monitor, one should be able to follow what I have described in the prints I have already offered. You are very welcome to present a better picture of the '7 star region'. PS. I have added another picture which illustrates how the '7 star region' in the 1933 print is created by LARGE INK DOTS that have filled-up the (white) zones between the ridges. My 'holistic' thought for today is that I just noticed that Lynn included in her second reply in this discussion a Disney-picture which includes... a '8 pointed star'! PS. Sorry this observation made me rolling-over-the-floor one more time.... especially since I think that Lynn's comment featured with the picture, also becomes quite funny in the perspective of how our discussion developed. I just found that maybe I better had described the '7 pointed star' ... as an '8-pointed star' (see the picture below). PS. Though of course: any 'ridge-star' is just a visual illusion, created by the ink dots that came on the paper between the ridge lines due to the use of too much ink. 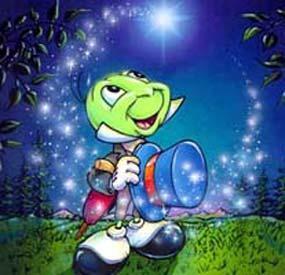 I think we should make a wish on these stars! "Why does it take so much efforts to find any agreement about Walt Disney's three left index finger fingerprints?" 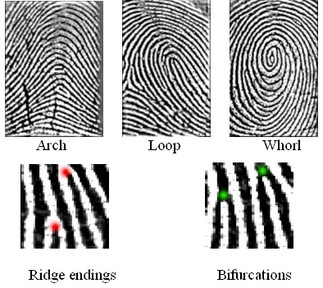 ... An interesting aspect of this discussion is that it illustrates perfectly why in the forensic sciences the 'fingerprint pattern classifications' are never used as FORENSIC EVIDENCE! Because fingerprint expert are very aware that any fingerprint can always show minor- and/or major errors. And in this discussion we can see how minor errors can result in a different assessments for the same finger(print)! PS. I repeat: the only assessment that CAN be confirmed by the similarities between all three fingerprints... is a RADIAL LOOP. But I can understand that anyone who doesn't recognize the errors that I described for both the 1933 print and the dark 1937 print, can decide to assess this fingerprint as a TENTED ARCH... though, that assessment is NOT supported by the ridge lines seen in the 1937 print. So that 'problem' should make you see that there is something not right with the TENTED ARCH assessment...!!! Etc., etc. I think I have a surprise for all of us!! We are not looking at smeared ink at all - that area is actually a thick clump of tissue with pores!!!!! One large ridge area.